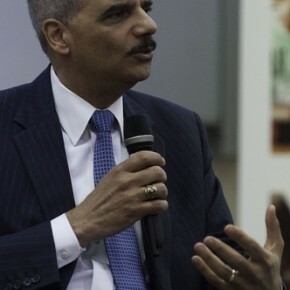 While Attorney General (AG) Eric Holder delivered remarks at the Justice Department’s Lesbian, Gay, Bisexual and Transgender Pride Month program, he also released the 46 names of indefinite Guantanano detainees. And while his remarks are easy to find, this list is not so easy to find on the DOJ site. The Obama administration is ushering us into a Bi-Bi Party Polarization age, replete with progressive news on the domestic front and transparency news on the foreign front. Transparency is a bipartisan issue, accounting for the second bi in the new era of Bi-Bi Party Polarization. Thank you, Marc [Salans], for that warm and very moving introduction – and for your leadership as President of DOJ Pride. I’d also like to thank Rhea Walker, of the Office of Justice Programs, for sharing her talents with us this morning, and Richard Toscano – and his colleagues from the Justice Management Division’s Equal Employment Opportunity Staff – for all they’ve done, working with DOJ Pride, to bring us together for this important observance. It’s a privilege to be included – once again – in this annual celebration. And it’s a pleasure to join so many friends, colleagues, supporters, and strong allies in commemorating LGBT Pride Month. I’d like to begin today’s program by extending a special welcome to our distinguished guest speakers: U.S. Senator Tammy Baldwin and award-winning recording artist Melissa Etheridge. It’s an honor to have you with us. I’d like to congratulate each of the award recipients whose contributions are being recognized by DOJ Pride today, and thank them for their courage – and their leadership – in helping to address some of the most persistent challenges facing the LGBT community. Especially this morning – as we reflect upon the theme for today’s event, “Celebrating a Year of Firsts,” and await the Supreme Court’s decisions later this month, on the Defense of Marriage Act and Proposition 8 cases – it’s fitting that we pause to highlight the achievements of a few of the key leaders who have made possible so many of our recent steps forward. And it’s imperative that we continue to honor the core principles – of inclusion, opportunity, and equal justice under law – that must always define our nation’s justice system, and must continue to drive our pursuit of a more perfect Union. Thanks to leaders in – and far beyond – this room, as Marc just said, our nation has made great strides in overcoming the obstacles and biases that too often affect gay, lesbian, bisexual, and transgender individuals. And nowhere is this clearer than in the work of the Civil Rights Division. Under the landmark Matthew Shepard and James Byrd, Jr. Hate Crimes Prevention Act – which President Obama signed into law in 2009 – we’ve strengthened our ability to hold accountable those who commit acts of violence that are motivated by someone’s actual or perceived gender, sexual orientation, gender identity, or disability – and to achieve justice on behalf of all who are victimized simply because of who they are, or who they love. Over the last two fiscal years alone, we’ve convicted the most defendants on hate crimes charges in more than a decade. Beyond this work – as part of an Administration-wide commitment to stopping harassment, bullying, and abusive behavior – we have partnered with a variety of agencies, including the Department of Education, to forge new alliances between educators, school administrators, and anti-bullying advocates. We’re drawing on the knowledge of experts as well as law enforcement professionals in seeking to promote healthy educational environments. And we’re leading by example in this regard, by working to create an open and welcoming environment right here at the Department. Through the internal Diversity Management Initiative I launched in 2010, the Department is working to recruit, hire, develop, retain, and support a workforce that reflects the rich diversity of the nation we’re privileged to serve. We’re expanding programs for promoting fairness, equality, and opportunity for every member of the DOJ family, which today includes an increasing number of openly gay and lesbian U.S. Attorneys, senior Department leaders, U.S. Marshals, and career employees. As many of you know, two years ago, I approved and expanded the Department’s Equal Employment Opportunity Policy to include – for the first time – explicit protections against gender identity-based discrimination. And this morning, I’m pleased to report that – earlier this year – I approved the establishment of a formal LGBT “Special Emphasis Program” that will help us take these efforts to a new level – by helping to provide the opportunities, and instill the respect, that every public servant needs to develop, to grow, and to thrive – both personally and professionally. There’s no question that these new actions and policies constitute promising steps in the right direction. But – like all of you – I also recognize that our nation’s journey is far from over. And, despite all that we’ve achieved in recent years, the road ahead – toward equality, opportunity, and justice for every American, regardless of identity or orientation – still stretches beyond the horizon. Although we can be encouraged by the work that’s underway, and by developments like the bipartisan reauthorization of the Violence Against Women Act – which includes protections for lesbian, gay, bisexual, and transgender individuals – the fact remains that, across the country, far too many LGBT Americans suffer discrimination each and every day. That’s why the Department will keep working to promote opportunity and access for every individual. It’s why this will continue to be a priority for this Department as long as I have the privilege to serve as Attorney General. It’s why we will continue to advocate for essential legislative changes and reforms, like the Employment Non-Discrimination Act, to extend workplace protections to all Americans. And it’s why we’ll keep relying on the passion, the expertise, and the steadfast commitment of talented professionals like all of you – and leaders like our awardees and special guests – to keep building on the momentum we’ve established, and fighting to ensure that the successes we’ve seen are just the beginning. There are, as we all know, two important decisions the Supreme Court must render in the coming days. Through our capable Solicitor General, and backed by the President, we have made our positions clear. Though we hope that the results of these cases are consistent with the core values that serve as the foundation of our great nation, the work that lies before us today will not be completed by favorable opinions. Especially this morning, we must recommit ourselves to the work that – however the cases are decided – will remain undone. We have traveled far together on the road to true equality and non-discrimination. But we are not yet at the end of our journey. There are still miles to go, children to be treasured, people to be protected, and rights to be ensured. Important, life-changing work remains. I can think of no one more qualified to discuss the importance of this work – and the impact of our ongoing efforts – than the dedicated public servant who, last November, made history by becoming the first openly lesbian candidate ever elected to the United States Senate, and the first female Senator to represent the State of Wisconsin – Senator Tammy Baldwin. Senator, it’s an honor to have you with us, and a sincere pleasure to introduce you this morning. Ladies and gentlemen, please join me in welcoming Senator Baldwin.